Amidst the hustle bustle of ever-running Delhi city, stands the quiet, the serene Purana Qila. Also known as Old Fort, Purana Qila is one of the oldest forts of the city. It is believed that the majority of the present citadel of Purana Qila have been built by Humayun and Sher Shah Suri. Purana Qila is not just a site of historical interest, but has become a popular picnic spot and lovers’ point for the present Delhi. It is often visited during the weekends or vacations. It is even more popular because of its location. Purana Qila is located on the Delhi-Mathura road and is close to the National Zoological Park. Although it is pretty old, the site is clearly not deserted because it is located in the heart of Delhi city. Not just the amazing architecture, greenery around the Purana Qila and the lake that provides for boating are the major attractions for tourists visiting the place. You may end up getting confused if you go through the history books for checking out the history of Purana Qila. 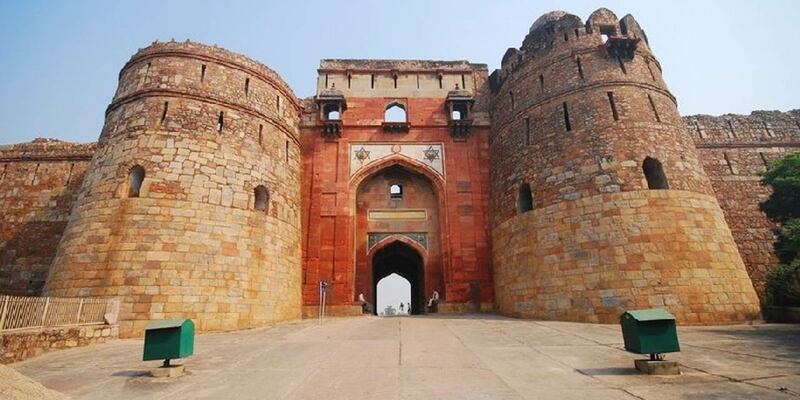 Popular belief is that the qila was built on the historical site of Indraprastha by Humayun and Sher Shah Suri. However, it is difficult to discriminate between their works as it is more or less similar. The common belief is that the walls and gates were built under the guidance of Humayun, while the buildings within the qila including the mosque and the Sher Mandal, have been built by Sher Shah Suri. In nutshell, it is believed that Humayun had rebuilt Indraprashtha and had named it Dinpanah, while Sher Shah improved the citadel. Purana Qila is rectangular in shape and is spread over an area of 1.5 kilometers. The walls at the east and west side of the qila are the largest. Each wall of the qila is 0.33 meters thick and and is sealed by massive bastions at each end. Unlike the other forts of the city, the walls of Purana Qila are not provided with frequent bastions. It is only on the west wall that the frequency of bastions has been increased, with each bastion placed about 73 metres away from the other. This was probably because the qila was surrounded by water from the rest of the sides, leading to increased safety. The bastioned ramparts of the Purana Qila are an epitome of strength. These massive structures are created of rubber masonry. Another amazing feature of the Purana Qila are the three gates that are a display of a happy blend of Hindu and Muslim styles of architecture. The Northern gate, also known as Tallaqi Darwaza, is embellished of panels, showcasing a man engaged in a mortal combat with a lion. The Southern gate also has similar panels, where lion has been replaced by elephants. Of all the gates, Tallaqi Darwaza is the most famous, being almost 39 metres taller than the low lying ground. The roof of the Tallaqi Darwaza is crowned by three chattris, supported by columns of red stones. These chattris were painted in white, giving a dazzling effect and striking appearance. However, beyond the amazing beautiful walls of Purana Qila are the notable buildings placed inside the fort. The buildings, Sher Mandal and Qila-i-Kunha Masjid, have survived the onslaught of times and still stand tall. Sher mandal, the double-storeyed octagonal tower is associated with the death of Humayun. While climbing the stairs of the building, Humayun slipped and lost his life. The Qila-i-Kunha masjid, however, was built around 1541 AD. It is known to be an important landmark in the history Indo-Islamic architecture. The beauty of the building speaks volumes of the architecture might that Sher Shah Suri had. It has been aptly described as one of the most perfect buildings of Sher Shah Suri by Fergusson. The Qila-i-Kunha masjid has been inspired by Jamali Masjid, that was erected fifteen years earlier. However, Sher Shah’s creation marks some significant improvements. It is improved and amplified and showcases a well-balanced composition. The Qila-i-Kunha masjid is not too large, as it is built in an area of 51X13.5 metres. It is 20.1 metres tall and is built of a variety of materials. The entrance arch of the masjid is made up of marble, while the spandrels of are made up of Red Stones with marbles studded on to them. The columns and plasters have been kept of white and black marbles. The unique blending of various colourful stones gives a fair sense of architectural style that Sher Shah Suri endorsed. There is also a museum inside the Purana Qila that takes you back in time. The exhibits displayed in the museum include the real things that were used by the royals. Done with the majestic history of Old Fort? Well, there’s more! While the Old Fort still charms the historians, students, researchers and tourists, a lot of people visit the place for recreational purposes. You must not miss the Light and Sound Show that takes place during late evenings in Purana Qila. Cutting edge projection and laser technology is used to present the history of Delhi and Purana Qila on ruins of the historic walls of the fort. You get a chance to witness the history of over 5000 years in one go, in a beautiful musical way. The most amazing part of the show is that all the nine pools of water come alive due to light, which looks rather fascinating. Purana Qila is also known for its boating. The tourism department had facilitated for boating in Purana Qila until the moats did not dry up. The department is working for the revival of moats. However, one doesn’t see boating starting anytime soon. The entry fee to visit Purana Qila is Rs. 20 for Indians and Rs. 200 for Foreigners. The fee for Camcorder is Rs. 25. Purana Qila is open from 7:00 am to 5:00 pm on all days of the week. Don’t forget to take your camera while you visit the Purana Qila. There’s a lot for you to capture. You can take still camera for free. However, you will have to pay a fee for carrying a video camera. Do protect yourself from mosquitoes while you visit the Light and Sound Show at the Purana Qila in the evenings. Club your visit to Purana Qila with a trip to nearby places like Delhi Zoo, India Gate, Children’s Park, Nizam-ud-din’s shrine. You can also explore shopping at nearby areas like Connaught Place, Palika Bazaar, Janpath and Sunder Nagar Market. Metro: The nearest metro station to Puaran Qila is Pragati Maidan Metro Station. You can take an auto or a rickshaw to reach the fort after you get unboard the metro. Bus: Purana Qila is located in one of the prime areas of Delhi. Buses number 73, 901, 405, 423, 502 and 425 ply to and from Purana Qila to various parts of the city. Auto/Cab/Taxi: One can use autorickshaws, cabs or taxis to reach Purana Qila too. Delhi has an amazing network of these medium of transportation. You can order them online via apps like Ola, Uber and Jugnoo or look out for them randomly while you are on road. Just be aware that autos, cabs and taxis follow a meter system, for calculating the fare. So, don’t get fooled while you are negotiating with them.